It's the giving season, and "Saturday Night Live" again found humor in a topic that keeps on giving so much material for comedy: the 2016 presidential election. In the episode's cold open, viewers thought they were settling in to watch one of the show's recent staples: the "Classroom" sketch. Something wasn't right though when a mobile device interrupted the scene. The student (Pete Davidson), "some random kid in high school," was shocked to find out he was just retweeted by President-elect Donald Trump. Alec Baldwin returned to portray Trump as he sits in on a security briefing with campaign manager Kellyanne Conway (Kate McKinnon). Baldwin's Trump couldn't bring himself to give his undivided attention to the proceedings. Instead, his thumbs continuously scrolled through his Twitter mentions from users hoping to "Make America Great Again." Conway tried to explain Trump's strategy. "He does it to distract the media from his business conflicts and all the very scary people in his cabinet," she said. Trump admitted, "That's not why I do what I do. I do it because my brain is bad." 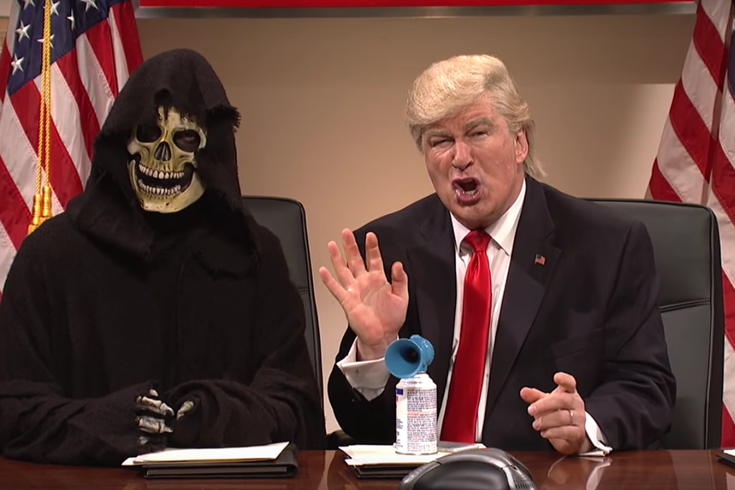 Baldwin's Trump finally buckles down to begin the briefing when his chief strategist Steve Bannon, who was dressed up as "Death," arrives. Since her defeat in the presidential election, Hillary Clinton has kept a low profile. A couple of times, however, she has been mysteriously spotted in the woods of her hometown of Chappaqua, New York by hikers. 'SNL's sketch unveiled "The Hunt For Hil” where two investigators search for Clinton, treating a sighting on par with seeing the Loch Ness Monster or Bigfoot.